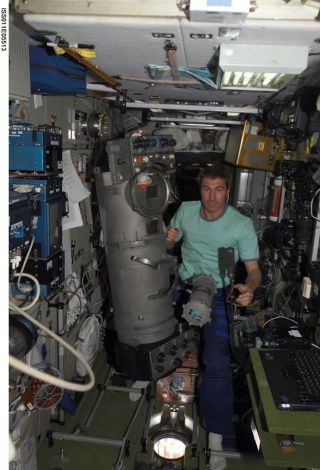 Expedition 11 commander Sergei Krikalev works with the Russian-built Elektron oxygen generator aboard the ISS on May 5, 2005. Nearing the end of its life expectancy, the generator has failed for good according to ISS managers. With theirprimary oxygen source broken and another running out, the two astronauts aboardthe International Space Station (ISS) will ignite their first oxygen-generatingcandles Friday to test a reserve air supply, a NASA spokesperson said. ISSExpedition 11 commander Sergei Krikalev and flight engineer John Phillips will burntwo potassium perchlorate canisters, or "candles," before switching over to the reserveoxygen supply system full-time next week. "Theywouldn't need to use two candles tomorrow, but they're going to test them,"NASA spokesperson Kylie Clem told SPACE.com Thursday, adding that the twoastronauts are in no danger of running out of oxygen before the June arrival ofa fresh supply ship. On May 19, Krikalevand Phillips repressurized the ISS interior with oxygen from tanks aboard thedocked Russian cargo ship Progress 17, but those supplies should be depleted overthe weekend, NASA officials said. The spacestation's primary source of oxygen, the Russian-built Elektron generator, failedfor good on May 13. A finicky device nearing the end of its service life,the Elektron generator uses electrolysis to strip oxygen and hydrogen fromwater. The oxygen is used to sustain astronauts while the hydrogen is dumpedoverboard. Several ofthe last ISS crews worked with the Elektron to prolong its operation, including boosting powerto the unit to keep the oxygen flowing. In additionto the Elektron, Progress 17 oxygen, and potassium perchlorate canisters, a100-day air supply is also available inside two high-pressure tanks attached tothe U.S.-built Quest airlock, NASA officials said. While NASAhas stated that the Expedition 11 crew has 84 oxygen canisters onboard - a42-day supply - Clem said there are actually more, but station engineersfactored in the possibility of low-functioning or defective canisters in theirfinal estimate. "One candleis one day's worth of oxygen for one crewmember," Clem said, adding that past ISS crews have burned the oxygen-generating canisters. In 2004, Expedition 8 commander Michael Foale and flight engineer Alexander Kaleri burned the canisters for oxygen while working to pin down an air leak that was traced to a flexible hose. Duringtoday's test, the Expedition 11 crew will burn two potassium perchloratecanisters, one afterthe other, inside a device that fires an igniter to begin the process. Carbonfiber filters absorb non-oxygen impurities and a fan distributes the oxygeninto the ISS, Clem said. A singlecanister can take between five and 20 minutes to burn completely, NASAofficials added. A freshload of oxygen and other supplies are set to launch aboard the Progress 18spacecraft on June 16 and dock at the ISS two days later. Replacement parts forthe broken Elektron will not reach the space station until August, when anadditional Progress cargo ship will make another unmanned delivery. Krikalevand Phillips are now one month into a six-month stay aboard the ISS. They launchedtoward the space station aboard their Soyuz TMA-6 spacecraft on April 14 in aspace shot staged from Baikonur Cosmodrome in Kazakhstan. The two astronautsare the fifth two-person crew to the orbital laboratory and hope to receiveNASA's first space shuttle crew to fly since the Columbia disaster in July. Asecond shuttle mission is slated to dock at the ISS in September, deliveringastronaut ThomasReiter of the European Space Agency, before Krikalev and Phillips return toEarth on Oct. 7.